It’s kind of limiting to look only at recessions as predicted by the yield curve. What about growth? 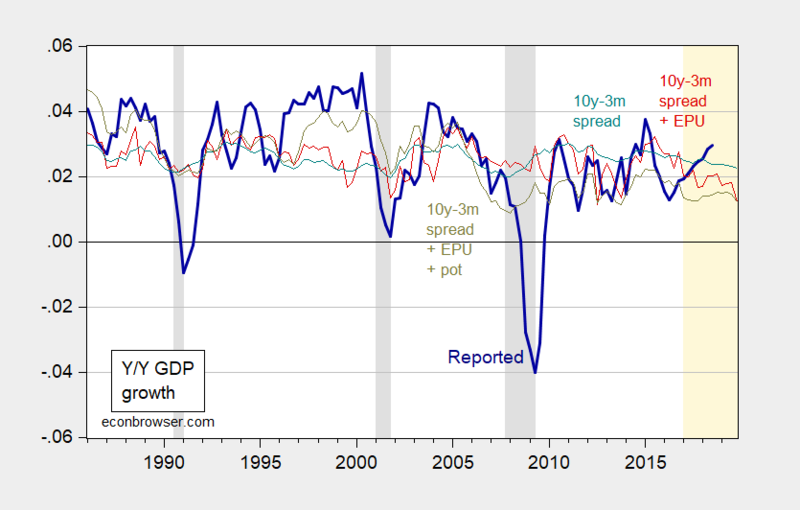 I run regressions of 4 quarter GDP growth (in log terms) as a function of one year lagged 10 year-3 month Treasury spread, the spread augmented by one year lagged economic policy uncertainty (EPU, from Baker, Bloom and Davis), and spread augmented by EPU and contemporaneous four quarter growth in potential GDP. Figure 1: 4 quarter growth rate in real GDP (dark blue), predicted from 10 year-3 month Treasury spread lagged one year (teal), from spread augmented by EPU lagged one year (red), and lagged spread and EPU augmented with contemporaneous 4 quarter growth rate in real potential GDP (chartreuse). NBER defined recession dates shaded gray. Light orange denotes Trump administration. Source: BEA, Fed, CBO, NBER, author’s calculations. Notice all forecasts suggest declining growth rates going forward — although the simple yield curve model predicts the least decline, and has the lowest R-squared at 2% over the 1986-2018Q3 period. All of these forecasts are accompanied by large prediction errors. Figure 2 shows the forecast from the yield curve EPU augmented model, and the 60% prediction interval (+/- 1 standard error). Notice the prediction interval encompasses negative values. 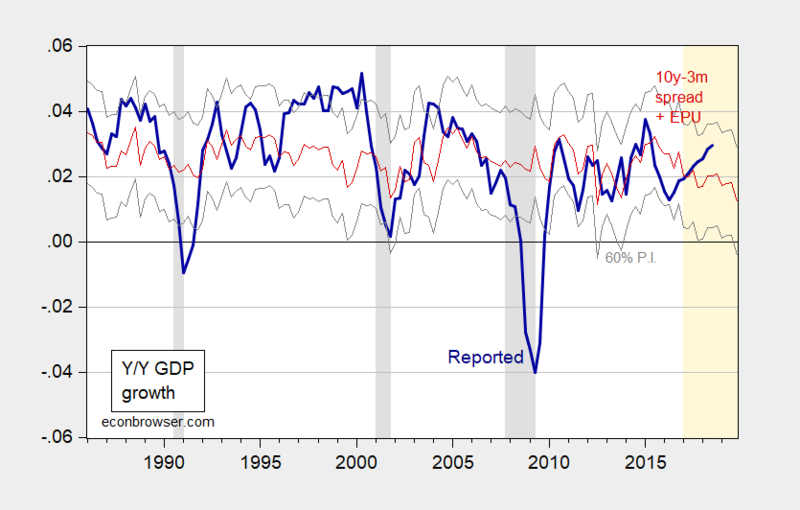 Figure 2: 4 quarter growth rate in real GDP (dark blue), predicted from 10 year-3 month Treasury spread and EPU lagged one year (red), and +/- 1 standard error. NBER defined recession dates shaded gray. Light orange denotes Trump administration. Source: BEA, Fed, NBER, author’s calculations. Many permutations are possible, including an estimate of the term premium, allowing a level term from the yield curve, and including a credit risk term. All this is just illustrative of what kind of slowdowns are implied by the standard model, and that incorporating one measure of economic policy uncertainty. This entry was posted on February 3, 2019 by Menzie Chinn. It would be interesting to see if any of these models predicts a negative q/q growth rate of real GDP over the 2019 forecast horizon. Any chances of having a look at that Menzie? Moses Herzog: Ta xie xie nin! For the Cantonese / old-fashioned among us, Gung Hay Fat Choy to all. My understanding is Cantonese is slightly harder than the Mandarin. I got no chance on that one. Although If I had more courage and had been in the South (I was very very very close to living in Fuzhou city of Fujian province). It was really really close call between Dalian and Fuzhou for me. I don’t regret the Dalian choice, but I do wonder how differently things would have gone in Fuzhou. I was told Fujian is known as a place where some of the smartest Chinese are, but I’m sure it’s a stereotype, similar to NYC being the place where smart Americans are. I mean I know the obvious comparison to NYC for China would be Shanghai, but you get what I am trying to say. My understanding was also (and we’re talking decades even before I was there) that Fujian was also the place where most Chinese immigrated to the USA from. I’m not sure if that was connected to ocean shipping routes or what?? But I know I had heard that from semi-respectable sources. I do know one thing though, Chinese culture has made American culture richer, more texturized, and America is all the better for it. And that includes these great Chinese holidays. I also like the sticky rice in the banana peel thing on Dragon Boat Festival and all that stuff. So much fun. And a Happy Lunar New Year to you, Menzie, :-). You’re not supposed to depress people over the holidays. Although maybe Chinese pork producers are very happy now. Their prices are indeed up. And the price of bacon is lower for American consumers. Of course more pork consumption may expand the eater’s waistline – like the waistline of Trump and Chris Christie aren’t big enough already! Probability of recession starting within nine months: As of last Sep = virtually zero. As of Oct = 29%. Nov = 34%. Dec = 51%. Jan = 64%. Feb with only 2 days of data and extrapolation of the monthly components = 59%. Nine months out is now Nov. Probability slowed its rise in Jan and slipped back in Feb due to stock market rally since Christmas. Probabilities based on proprietary model. The firm recession call comes when the model probability approaches the close neighborhood of 100%. At this point the lead time is still 3 or 4 months. Yield curve is part of the model, though not the segments of the curve conventionally used. Main takeaway is probability of recession has been rising dramatically but for the highly tentative February number. Recession will be avoided (or brought on) by the 107,000 indictments–now sealed–that will shake the western world. Or not. IF, that is, the indictments actually are delivered. By February. Or March. Or maybe later. We’ve gone from 100% certainty to IF, to well, maybe. It was the best of times. It was the worst of times. It was the age of wisdom, it was the age of foolishness…. Powell and donald trump comparing notes on which brand of grecian formula hair color is best. donald trump says “pumpkin head” is his “go to” brand. Powell says “brown-noser” is the grecian formula for the man moving fast up the career ladder. Powell dipped his non eating hand in lube and trump said “not now”, but he would confiscate the tube of lube for his next meeting with Putin. Last time Putin took him dry and his golf swing was off for the entire next month. Can we agree that GDP growth should be slower in 2020 than now?